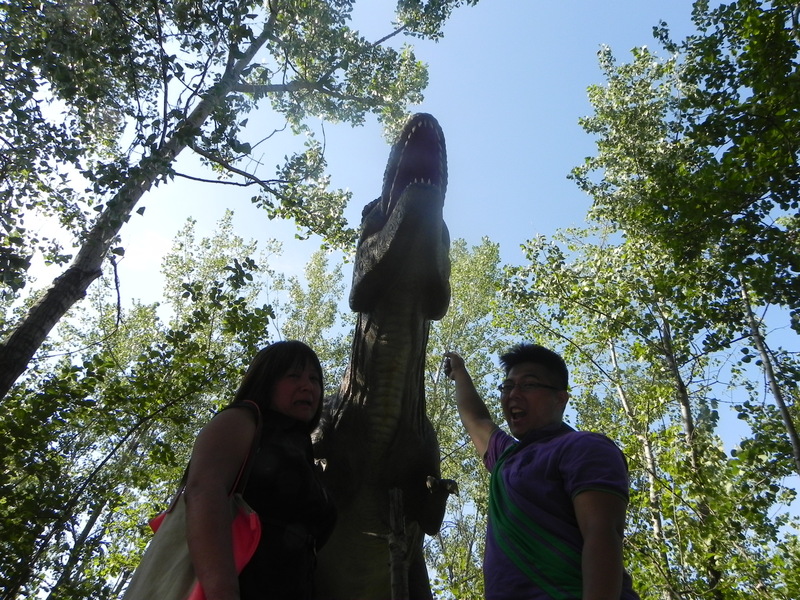 Could it be that there is a park that features dinosaurs?! Yes, your dreams have just come true. Located in Secaucus, New Jersey, this place had a LIVING SOCIAL deal recently and that’s why we decided to try it out. And…okay fine, we really went to let our inner nerds out. I mean, who DOESN’T LOVE dinosaurs? We aren’t really sure why people were rolling in with their kids on a Saturday around late 3pm. Make sure to bring extra $10 for parking fees though. They consider the fee as a “environmental fee” and urge you all to take the mass transit instead of driving your car. The park features about 32 dinosaurs in a small dirt covered area. Make sure also not to wear your nicest clothes to this park, you will definitely get covered in sand/dirt that is all scattered around this park. However, the real deal is: Did it live up to our expectations? Check out this video we recorded. It features how the dino-bots move! I personally didn’t think this place was worth the trip. However, I will give them an extra star for effort. It seems silly, but I expected a lot more from a place like this. Because of my crazy imagination, I was thinking there would be dinosaurs that you could actually see move and not lay stagnant in the bushes or behind trees. The park was also awfully designed with tacky sponsor messages everywhere. I would definitely recommend this place for parents with children, since adults will not enjoy this place. What I did enjoy was that at least they made the dinosaurs look like they were living and breathing. Some were even interacting with their environment when their tails were swishing around little weeds. I wish their sounds were a bit louder though, even though I would understand the young children would be scared of them. BUT HEY, they’re freaking dangerous dinosaurs — they should be scary as hell. I wish I could ride these little dinos..I’m not asking for a lot right? Okay, maybe I am. I see a lot of things they need to fix though. One thing especially, they need to expand — we finished walking around within an hour. I actually wonder what would happen if it rained too…the park is all filled with this sand stuff that got all over my dress and shoes! Blegh. Ladies, even though this is a crazy small park, leave the heels and fancy maxi dresses at home. We got our day-passes from LivingSocial.com and for $12 each. Normally, its $25 per adult, $20 for children (3-12), and free for kids under 2, without any additional extremities like 3D movies or a trip to the Commander’s tent. On top of that, if you drove here, expect to pay another $10 for parking. Because of the recent deal, the park was crowded with so many people. Coming here will give you the feeling of entering into the land of Jurassic Park. Giant gates with overgrown trees and shrubbery everywhere. The park workers and staff are semi-helpful. I think it would also be appropriate for workers to hide their tattoos as well since there any many children and parents watching the shows. The amphitheater show was a little disappointing, but it was definitely aimed more at children for sure. The show started almost 15 minutes late and we were baking in the sun. Basically, it was just a couple of guys inviting kids to dance as he was playing guitar and singing. I guess it’s time to review the dinosaurs themselves. I guess I was semi-impressed with them? They were modeled pretty realistic and probably look a lot more realistic to a child. Some of the dinosaurs were robotic, so they would move their neck, blink, breathe, swing their tail, rotate their head, etc. Dinosaur audio calls were usually these hidden speakers or speaker rocks next to the dinosaurs. Some of the dinosaurs tower you, which is pretty awesome. Pinky and I had a lot of fun trying to “run-away” from the immobile robots. I think of all the dinosaurs at the park, I was the most disappointed at Pterodactyl near the center of the park on a tall cliff. It was basically just a dinosaur model on top of a spinning disc, rotating aimlessly. I think more thought could be put into some of the things at this park. Overall, I just don’t think it’s worth coming if you’re going to pay the full price. It’s definitely cool place to bring your kids and because I’m pretty sure Pinky and I were the only adults without kids there that day. Posted on July 30, 2013 July 30, 2013 by pinkytwinkieeePosted in New JerseyTagged camera, children, deals, dino, dinosaurs, fatherhood, fun, jurassic park, kids, living social, motherhood, parenting, parents, park, photo, photo opportunities, where to take your kids. Previous Previous post: Wafels and Dinges Cafe: Living up to the hype?